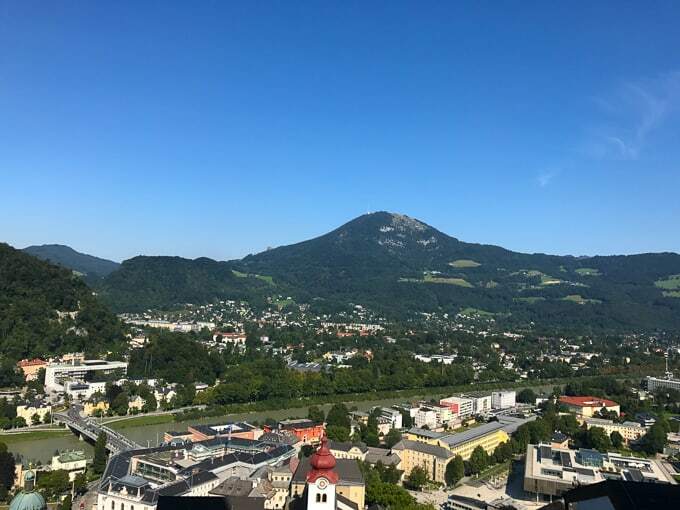 Traveling to Salzburg for the day and not sure what to see and where to eat? 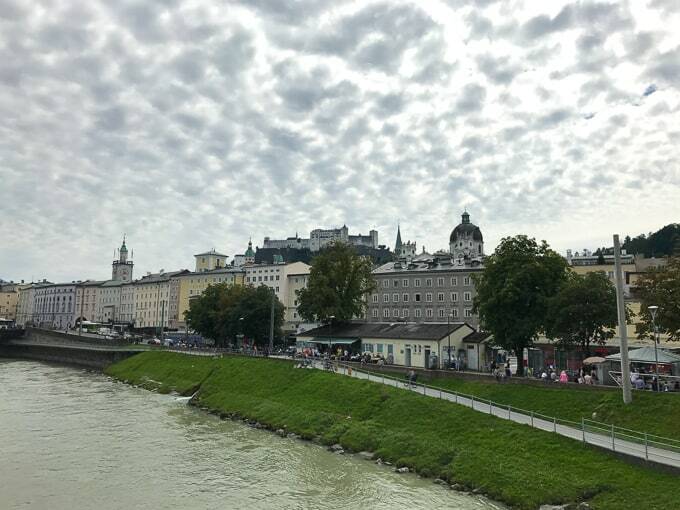 I gotcha covered as I walk you through my day trip to Salzburg from Munich. 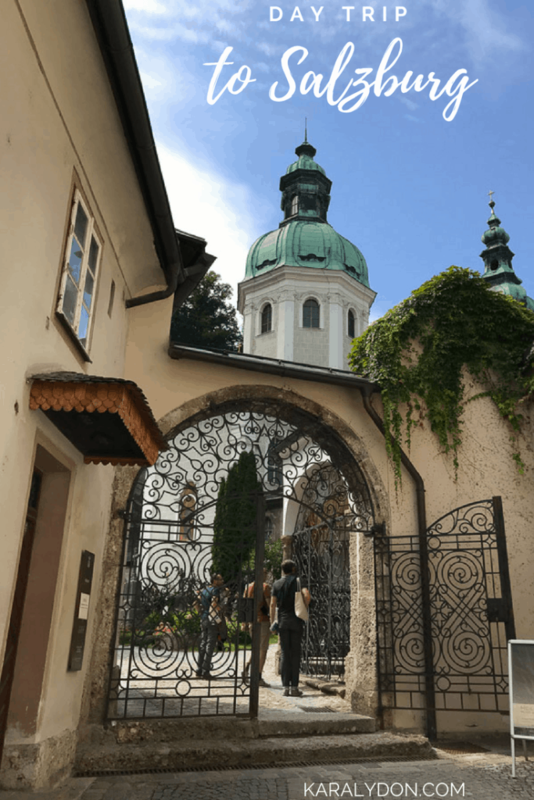 This post wraps up my trips to Europe this summer. It feels weird that I’m still writing about these now that summer has been long gone for what feels like forever as we enter the holiday season. 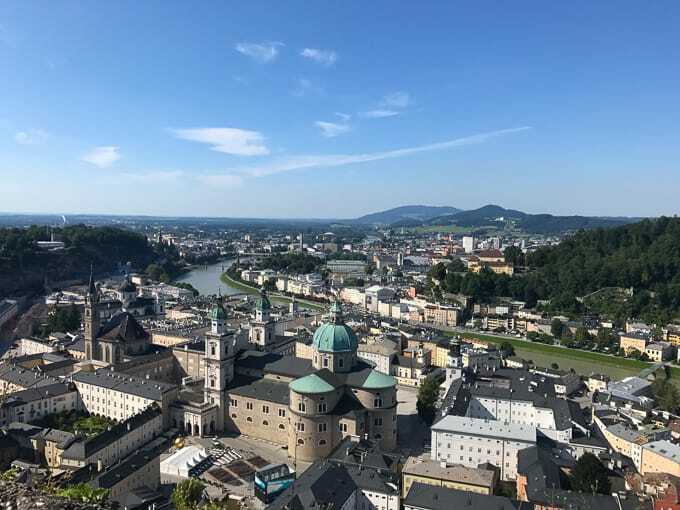 But hey, lots of people jet off to cute, quaint European cities like Salzburg for the holidays so hopefully this guide will help some fellow travelers this season. 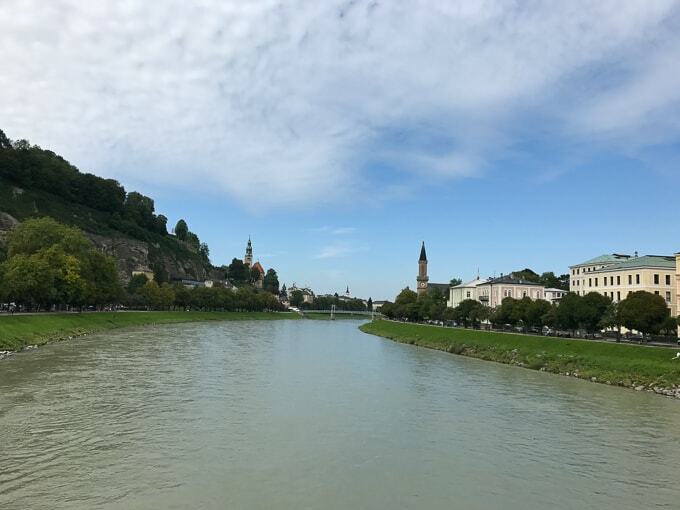 Full disclaimer – I had no idea Salzburg was so freaking close to Munich. 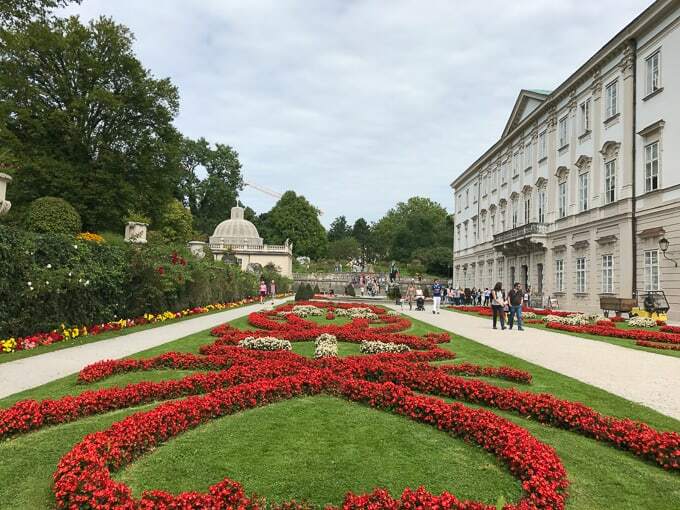 Munich was always in the books but once I got there and started researching what to do I realized that Salzburg was an easy day trip from Munich (only 2 hour train ride). I was like well I’ve already knocked off three countries this trip, might as well make it four! 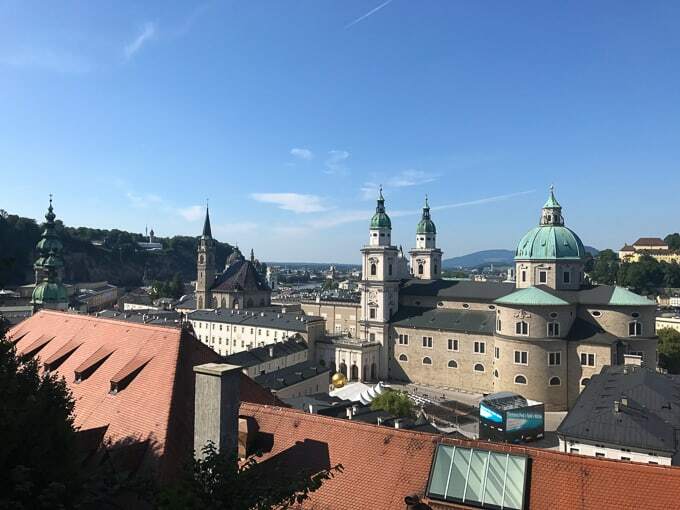 Plus, the Sound of Music takes place in Salzburg…need I say more?! And as I mentioned in my Munich recap, you really can see all of center city Munich in one day. 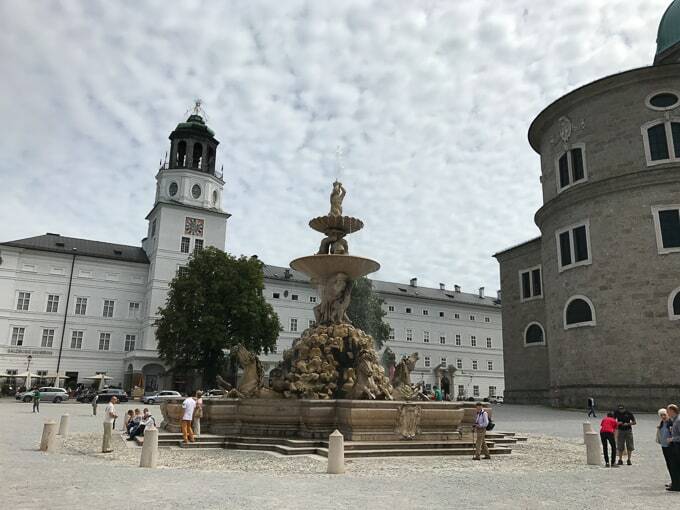 I left Munich a little after 9am and got into Salzburg a little past 11am. 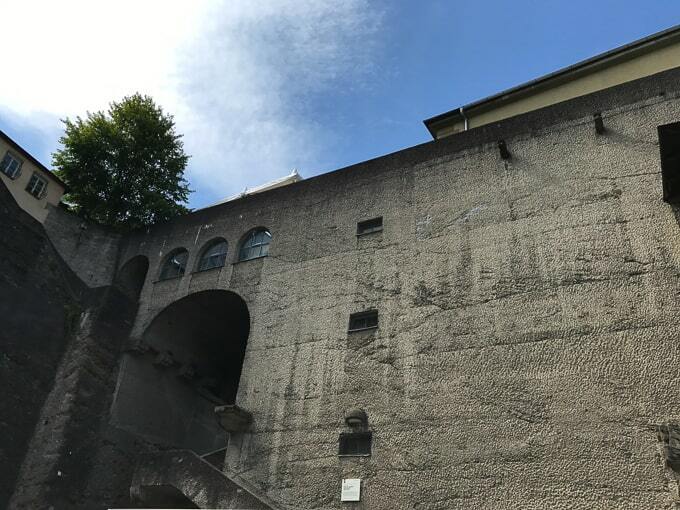 Arrive at Salzburg Hauptbahnhof Train Station and either walk 15-20 minutes to city center or take the bus. Basically I walked out of the station, followed the crowds to the bus and hopped on :). 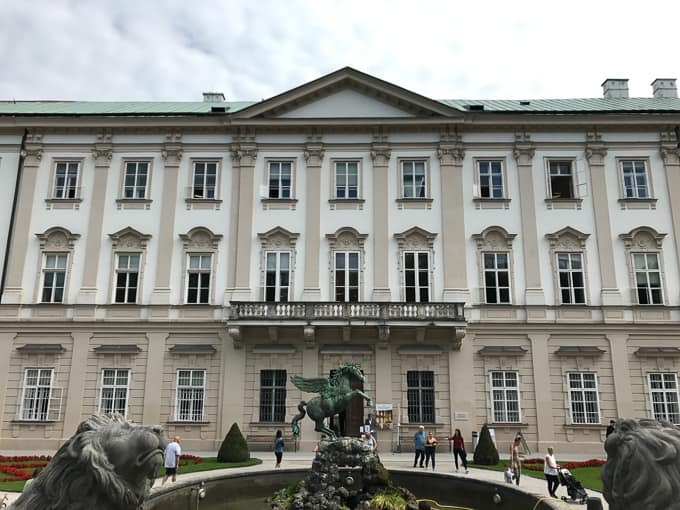 The bus stops right outside Mirabell Palace and Gardens, which sits just outside city center so I hopped off there first before making my way to the old town. 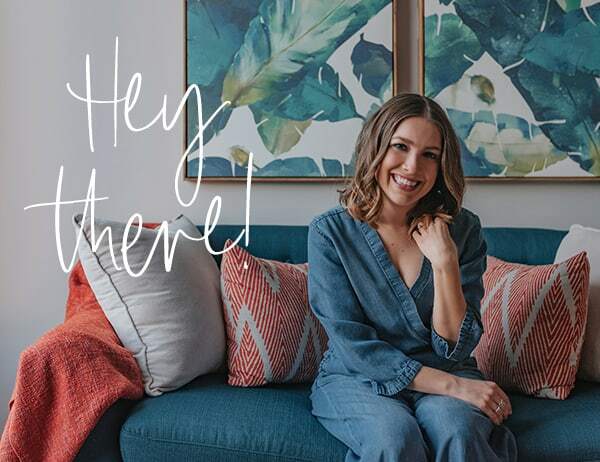 Now I’m a huge Sound of Music fan – I sang My Favorite Things for my first high school musical audition and probably way too many times in the shower as well. It was one of my fav movies growing up and I still love it to this day. 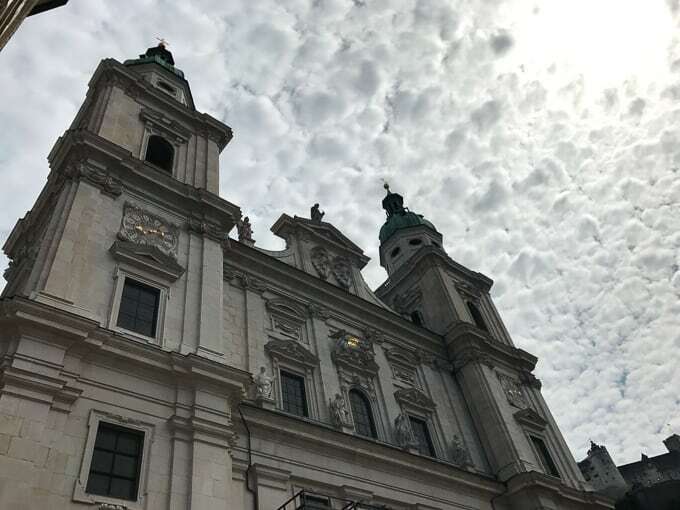 So it goes without saying that I had to hit up some of the Sound of Music sites while visiting Salzburg. 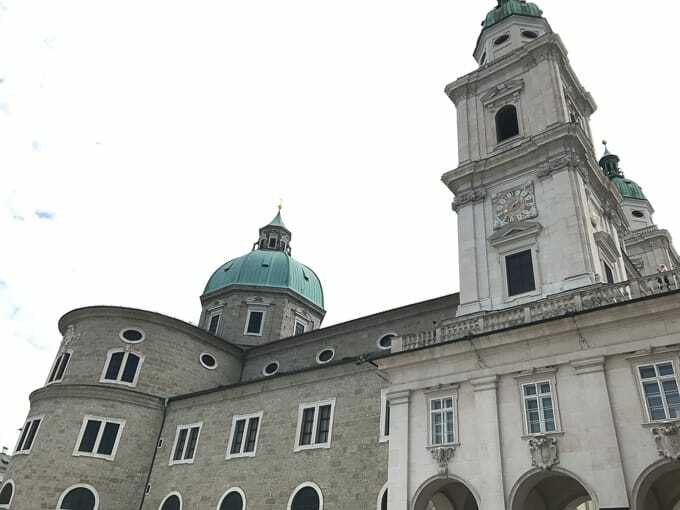 Fun fact, they have different Sound of Music tours that you can take in Salzburg, which I probably would have done if I had more than a day there. 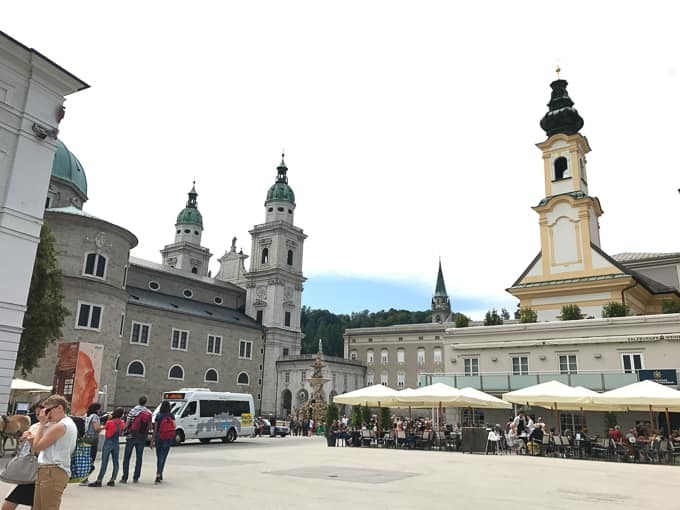 After lunch, I turned on Rick Steves’ audio guide for Salzburg and let him lead the way. 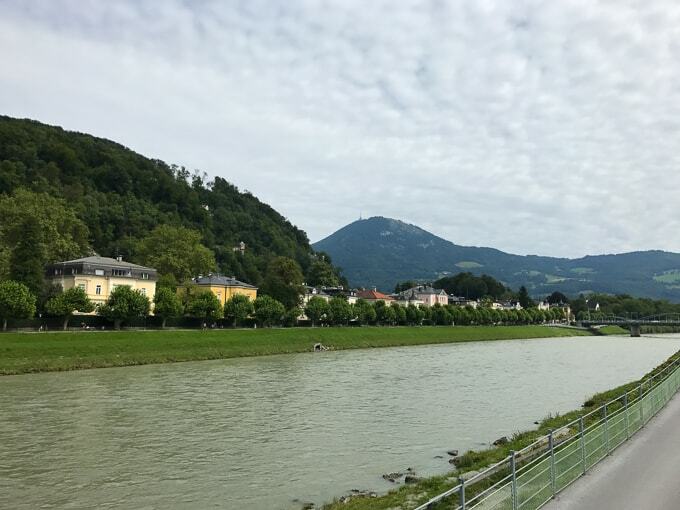 We started along the river on the Mozartsteg Bridge, built in 1903, which gained fame for being featured in the Sound of Music. From the bridge, I made my way to Mozartplatz Square, home to the Mozart Memorial. 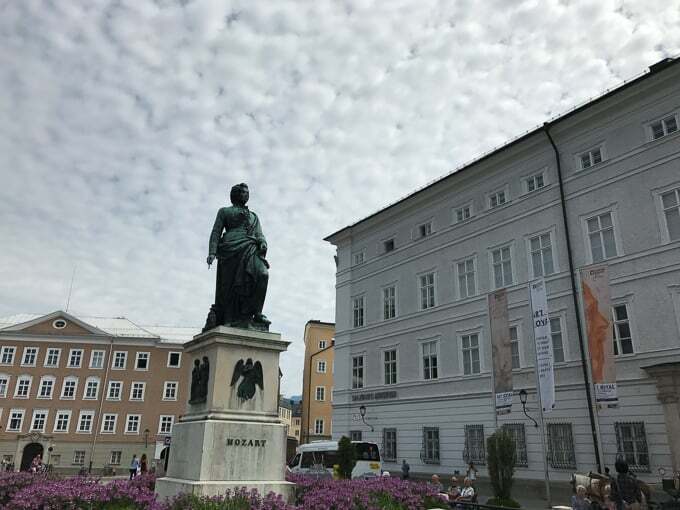 Another one of Salzburg’s claims to fame – Mozart was born in Salzburg and lived there for some time. 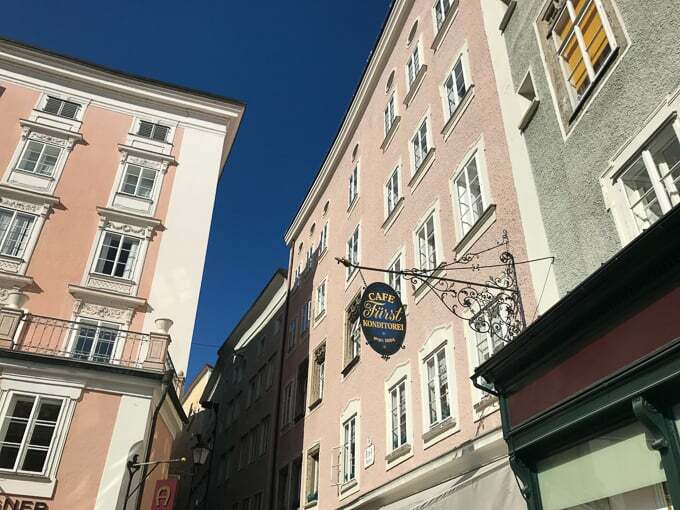 If you’re a Mozart fan, you can visit his birthplace, residence and the Mozart Museum. 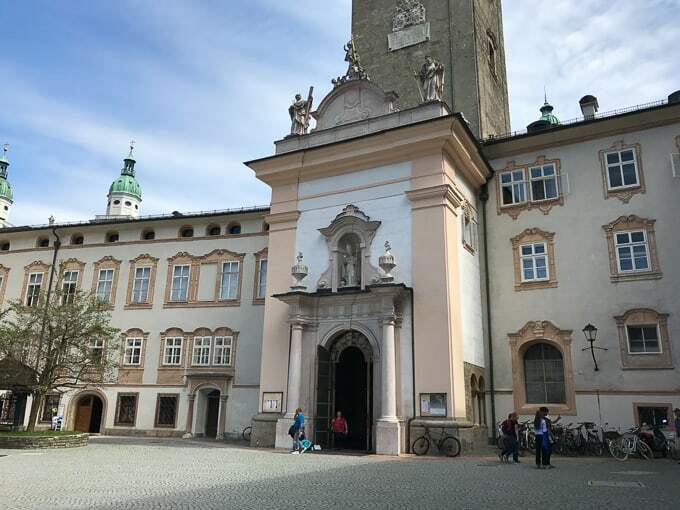 Next up, another square called Residenzplatz Square, right in the heart of Old Town, home of the Old Residenz Palace and New Residenz, which houses the Salzburg Museum and glockenspiel. 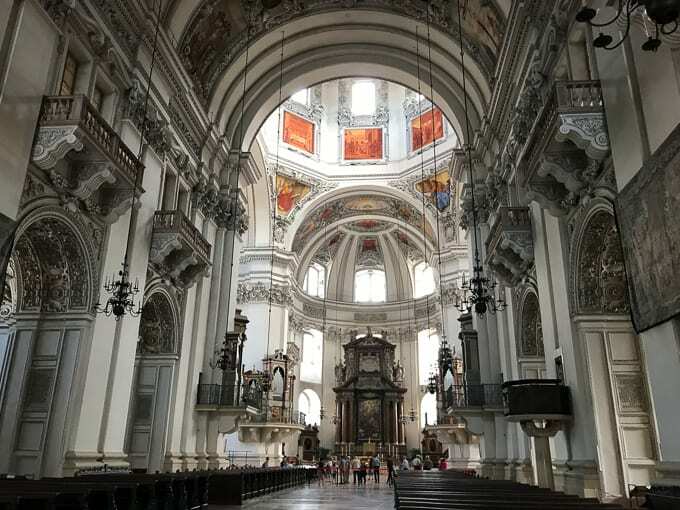 Right next to Residenzplatz is the Salzburg Cathedral. 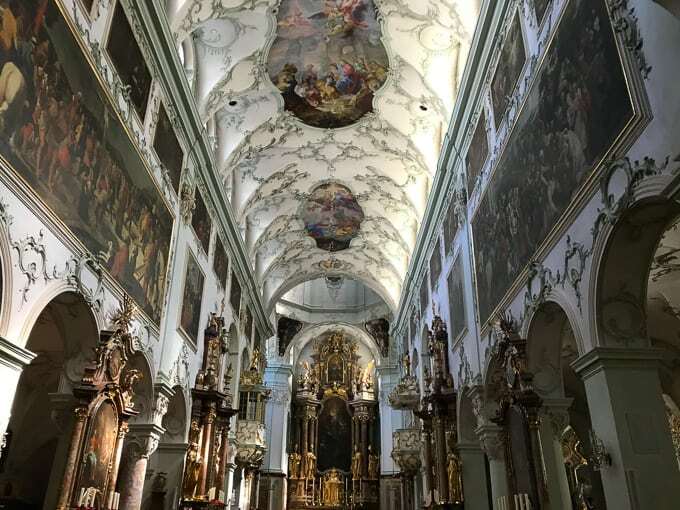 Walking inside churches is one of the most awe-inspiring things for me while traveling. The architecture, the details, the adornments, it’s all breathtaking. 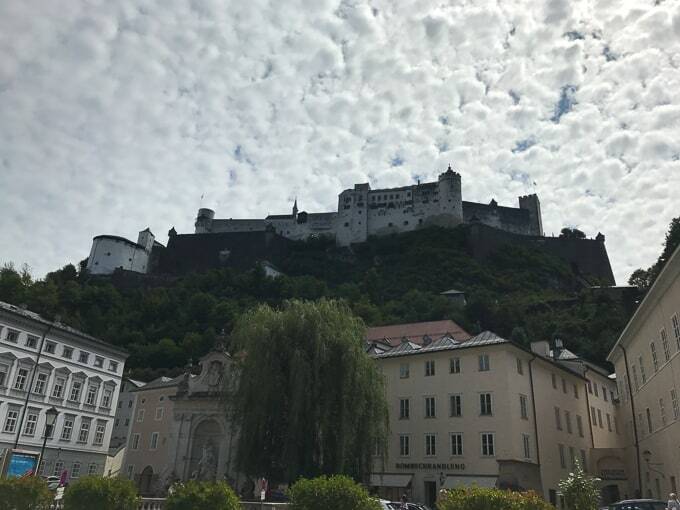 As you walk from the Cathedral to St. Peter’s Cemetery, you’ll glance up for a mighty fine view of Hohensalzburg Castle, one of the largest existing 11th century fortress complexes in Europe. 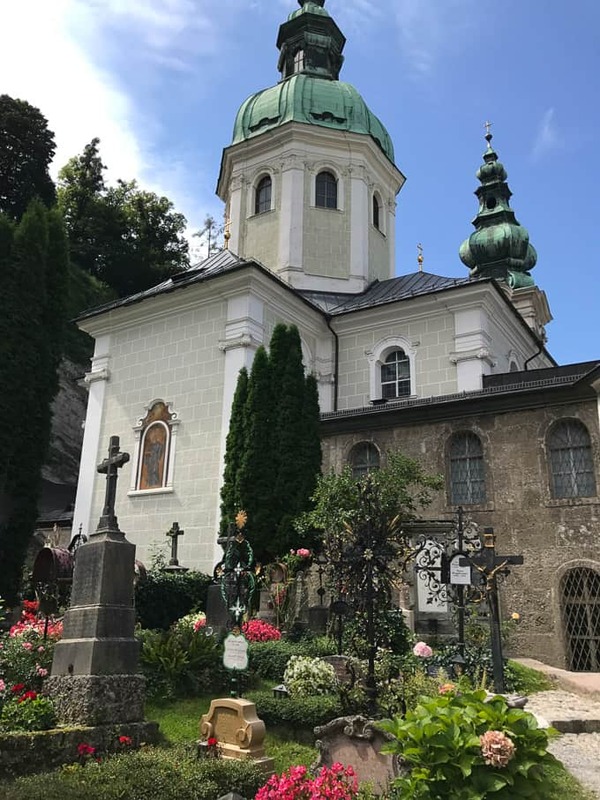 Another fun stop for this musical theater lover was St. Peter’s Cemetery, where they shot the scene in the Sound of Music where they are hiding from Nazis after their family concert. 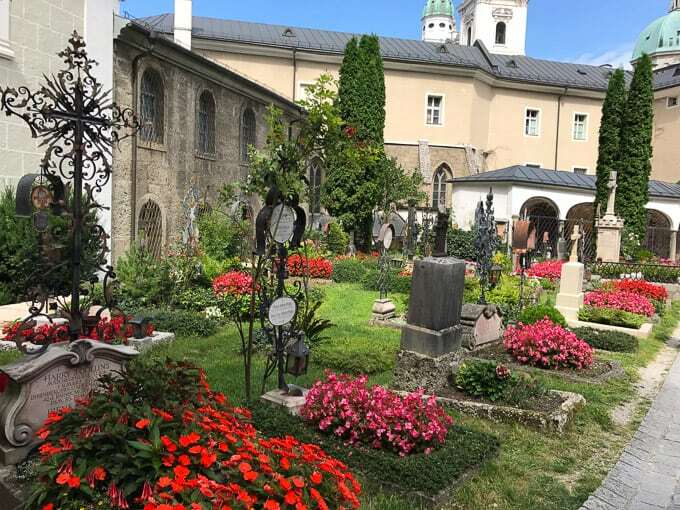 Well, actually, that scene was shot in Hollywood (womp, womp) but it’s based on this cemetery in Salzburg. Looks pretty similar to that set in Hollywood, eh? 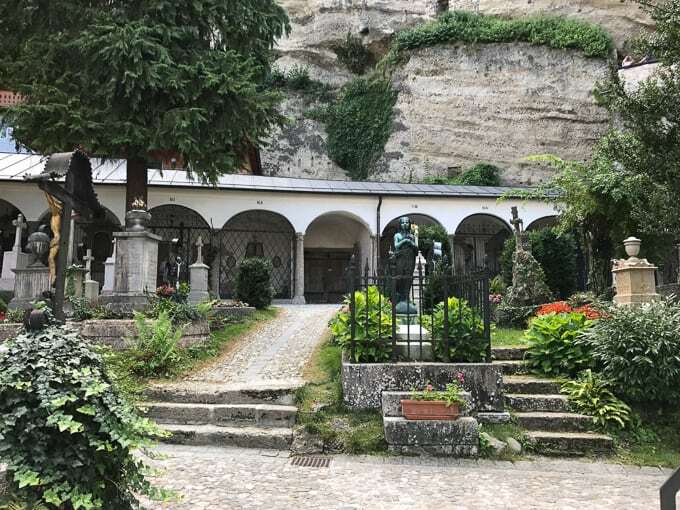 Continuing on the tour, next to the cemetery is St. Peter’s Abbey, which was founded in the 7th century. YUP 7TH. Crazy. 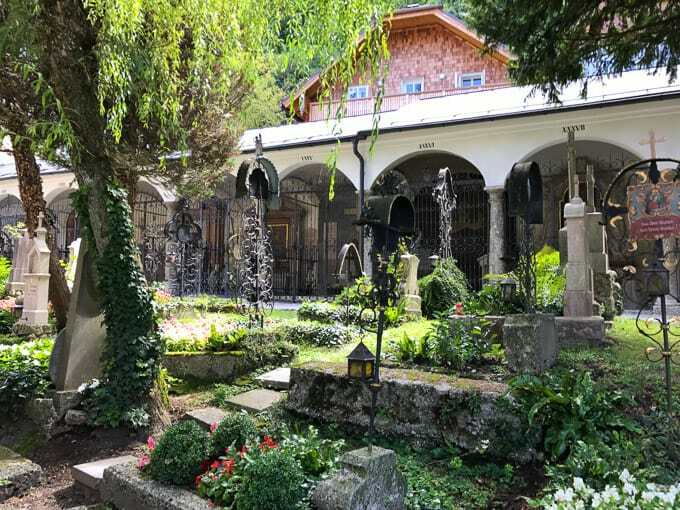 Nearby is the Felsenreitschule, which is a cultural and events venue where the Von Trapp family performed in the movie! 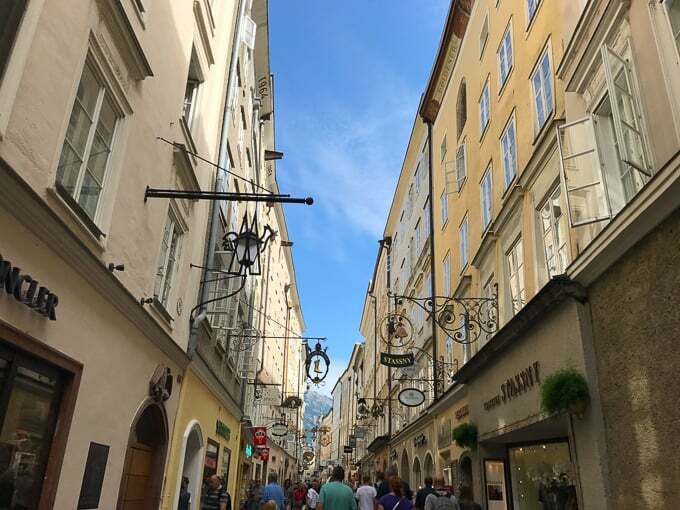 Sorry, that’s the last SOM reference for this blog post, I promise 🙂 I eventually moseyed my way over to Getreidegrasse, which is the charming main street of Old Town Salzburg. Tons of shops and home to Mozart’s birthplace. 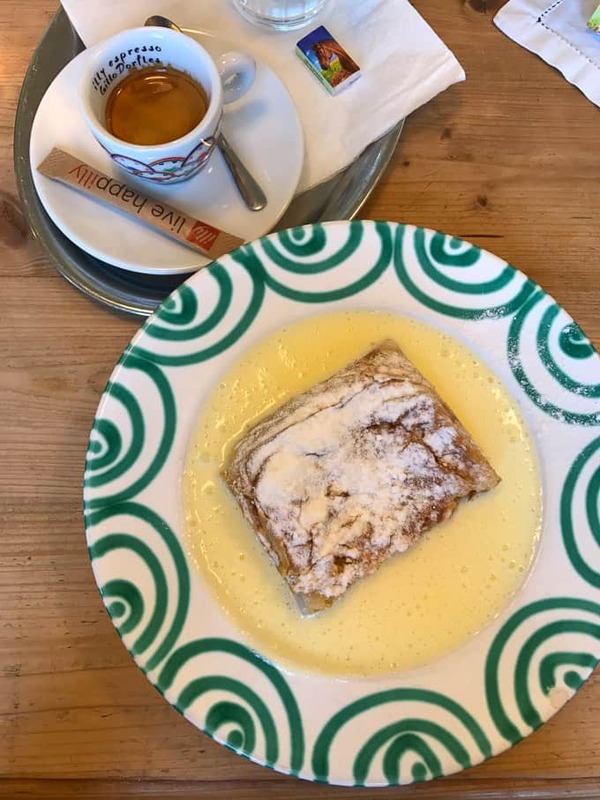 Now that my lunch had digested, it was time to try some classic Salzburg treats, like the apple strudel. 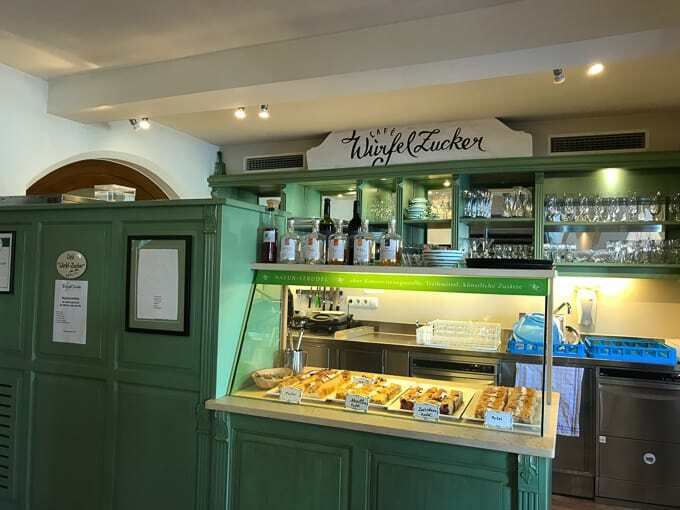 And apparently Cafe Würfel Zucker is the place to get one. Also, the name translates in English to Cafe Sugar Cubes, which I just love. And shout-out to Alex of Delish Knowledge for recommending the apple strudel! This strudel was unbelievably good. It was served warm in a pool of warm, creamy vanilla sauce. The pastry was buttery and flaky and the apples were so soft and cinnamony. I was in heaven. 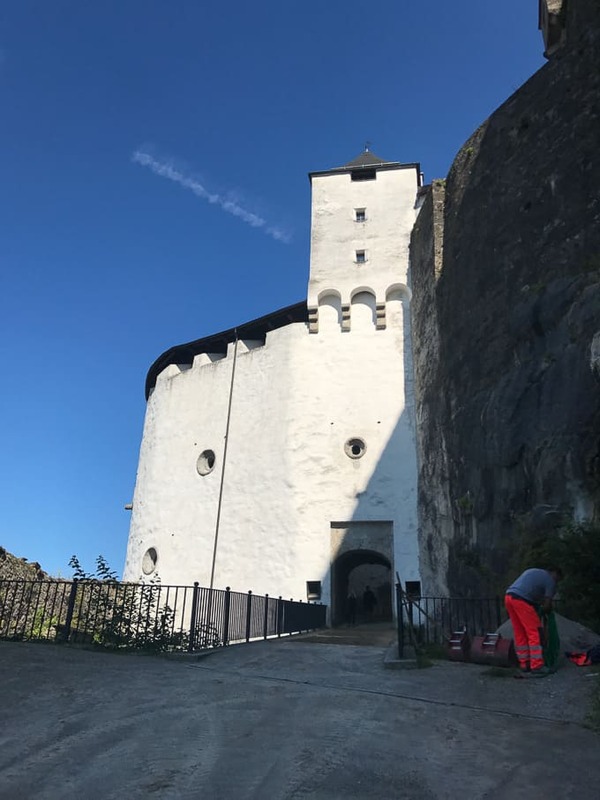 After afternoon treat #1, I walked up towards Hohensalzburg Castle for the best views of the city. 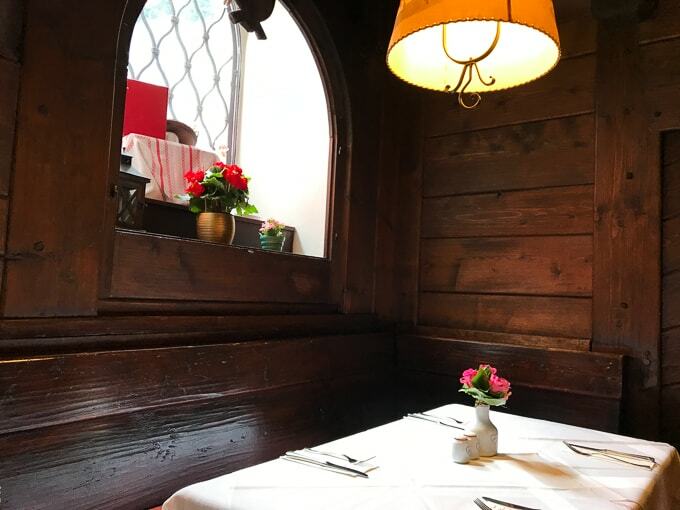 After my jaunt around the castle, I went to Cafe Konditorei Fürst, which is known for their Mozart Balls or Mozartkugel. Basically it’s a chocolate candy filled with pistachio marzipan and nougat that was named after Mozart. I grabbed a bag of these to bring back to my parents as a souvenir and just gave it to them at Thanksgiving but forgot to try one! Fail. Good thing I’ll be back home for the holidays. Mom, please save me one…or two. 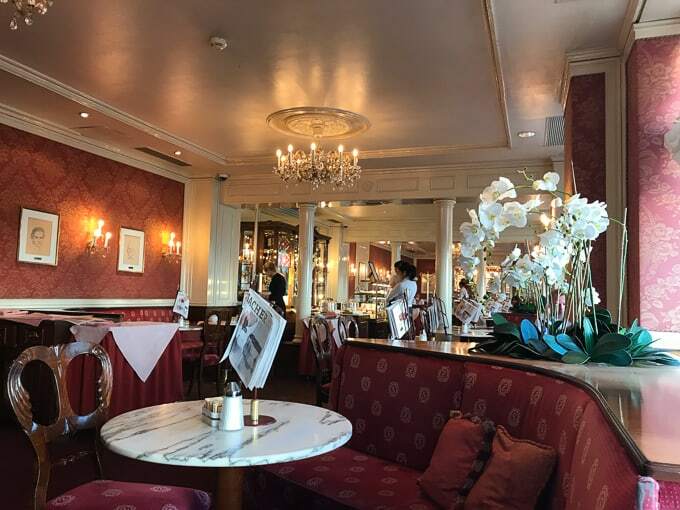 Afternoon treat #2 was at Hotel Sacher, known for their famous Sacher Torte. My sister-in-law told me about this place and said they had the best chocolate cake. I was a little skeptical because cake isn’t my jam. 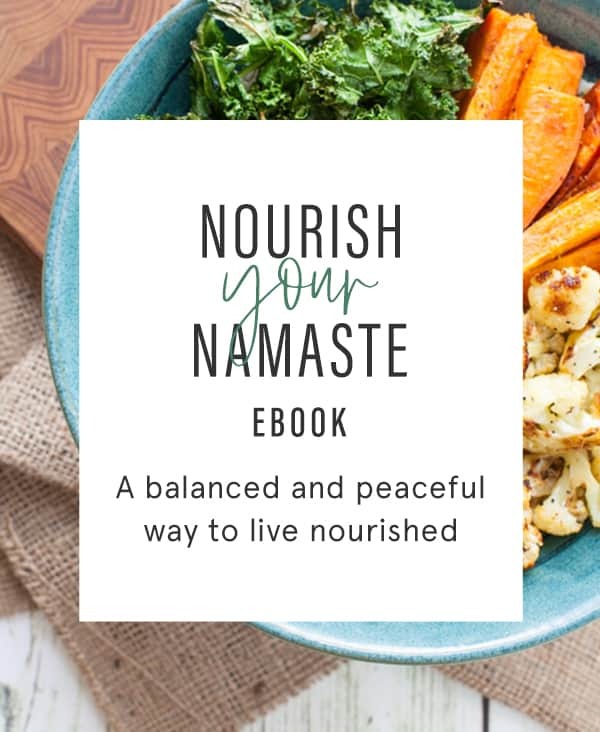 I’d much rather have a slice of pie or a brownie any day. 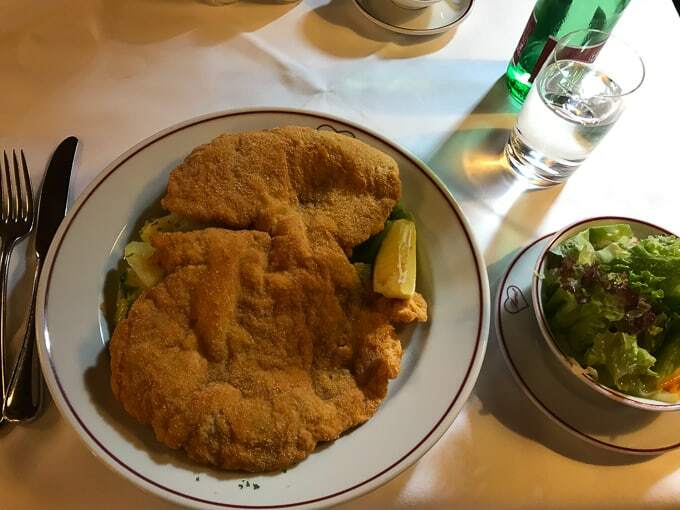 But I couldn’t leave Salzburg without seeing what all the hype was about. 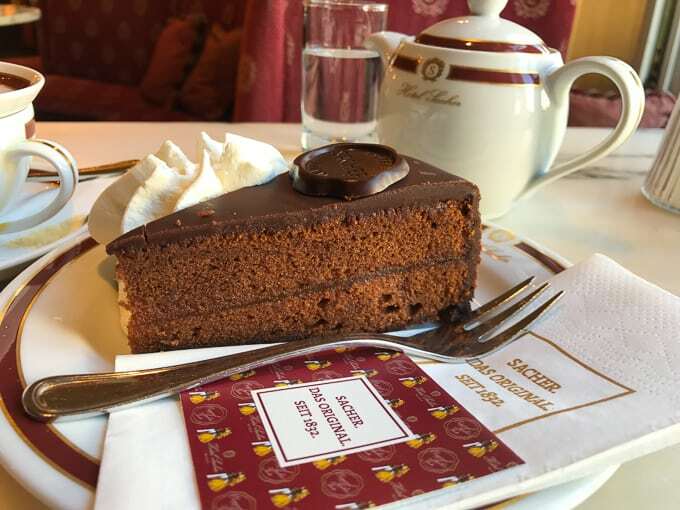 OH MY SACHER TORTE. It was as if I had died and gone to chocolate cake heaven. It didn’t even taste like cake. I was so moist and dense and the chocolate flavor was on point. They spread apricot jam over top before icing it so there’s a delicious subtle fruity flavor too. 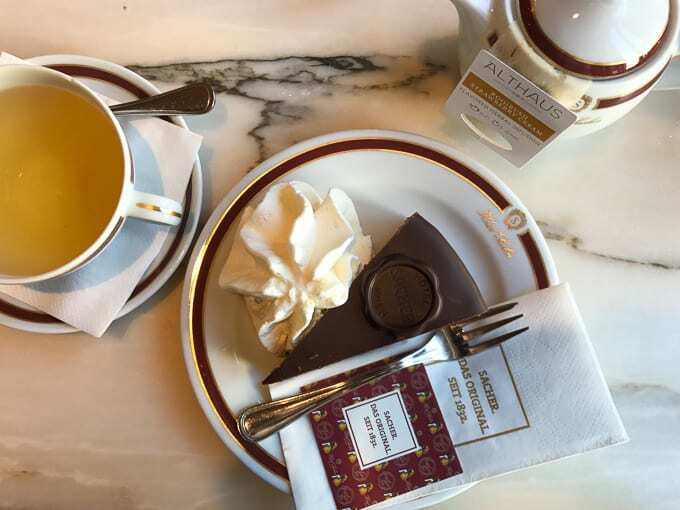 Fun facts about this dessert – it’s the world’s most famous chocolate cake with a recipe that has remained a secret since 1832 and more than 360,000 pieces are produced by hand every year. If they could just send 300,000 of those to Boston, that’d be grrrreeat. After my slice o’ heaven, I waited for the bus to go back to the train station and got there with about 30 minutes to spare. Back to Munich for one last dinner and then to the Nymphenburg Palace the next day before heading home! That’s a wrap! 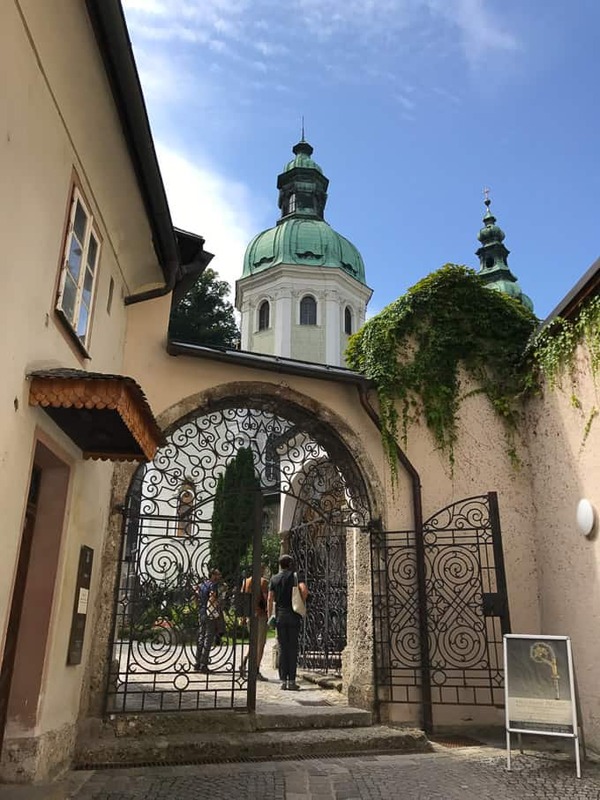 If you missed my other Europe recaps from this summer, check’ em out below! Where should my next trip be?? We’re thinking of heading to the land of pasta, gelato and red wine in 2018…ITALY! 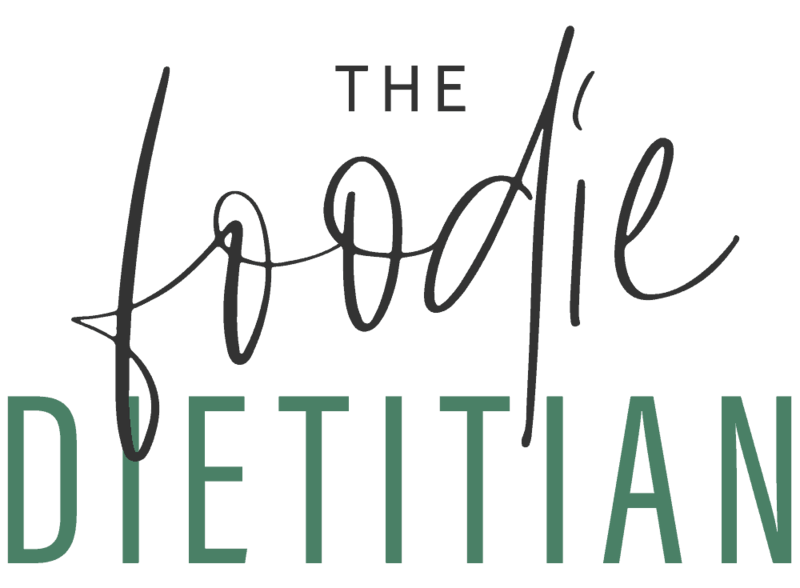 I’d love to accept food recs :). Thanks!